For temporary energy needs, contractors have much to consider when renting or buying a towable mobile generator. 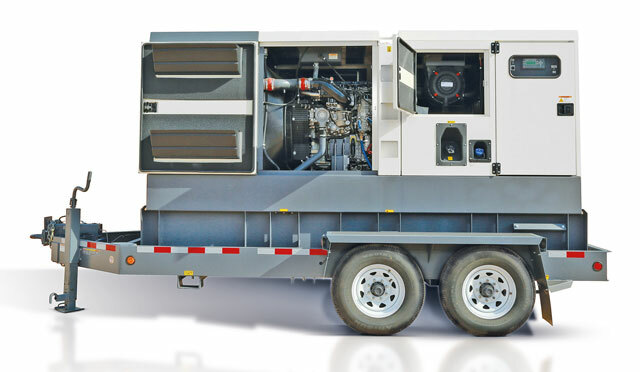 From ensuring load match to paralleling units, diesel generators engineered into a trailing format have become sophisticated machines with the ability to provide power pretty much anywhere at any time. Offering a range of features, these units are versatile and flexible — if the user understands their needs and the application. For the U.S. market, rental houses are a majority of sales for manufacturers like Atlas Copco, Chicago Pneumatic, Allmand and Doosan Portable Power. Renting to contractors for a myriad of applications, the growing rental industry has dedicated specialists that help contractors match a power source to the application at hand, so a great place to complement your research is at your local rental shop. For users that have a 24/7 need for power, they can always procure these movable power-makers for long-term use. Here are some technology and trends to consider for both. Commercial generators are benefiting greatly from miniaturization and other technologies that are allowing manufacturers to put more power into an efficiently-sized package (everything from computerization to the tensile strength of materials). Today, it’s possible to find fully portable generators with working power ratings into the hundreds of kilowatts. Overall, the applications of mobile towable units run the gamut. Anywhere there is a need for power, these gen sets appear. 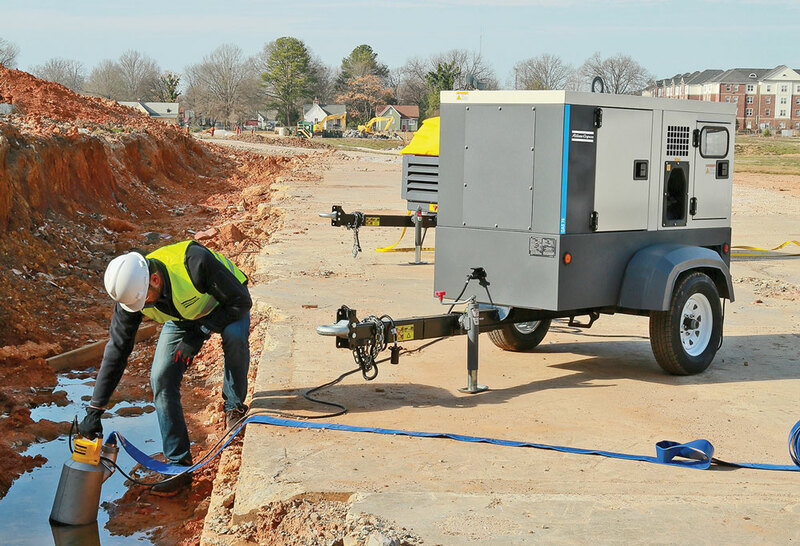 With much of their use in construction projects, from road work to oil and gas jobsites, mobile generators can provide a power source that can be moved with a work truck or even something smaller. Not to be outdone, 50-kW mobile gen sets are used in similar applications, just offering more power to the user. Mobile gen sets of all sizes have a strong presence in the event industry, providing that behind-the-scenes power for concerts, weddings, sporting events and carnivals. These units are usually rented and offer power in a location that previously did not have it. Knowing how the generator will be used makes it possible to calculate the necessary voltage and amperage (amps) — information typically displayed on the equipment data plate. Knowing the voltage and amps allows you to determine kilowatts, which dictates the amount of electrical power needed to operate the load. Ideally, a generator should run at 75 percent of load, which is why a 100-kW generator should not be operating only a 20-kW heater. However, 100 kW would be appropriate when running a 20-kW heater linear load along with a 50-kW irrigation pump with a cyclical load. You should also know that all portable generators have two power ratings: continuous power (i.e., running watts) and maximum power (i.e., starting watts). Running watts are what the generator can produce continuously while running, and starting watts are what it can produce for a short time to help start motorized electrical tools like circular saws or hammer drills. Typically, the biggest issue when sizing a generator is motor starting. Totaling up your power needs only requires a little math. List the items you want to power, find the item with the most maximum power (a.k.a. starting watts) and then add that number to the continuous power (running watts) for all the other units. Here’s an example: A circular saw takes 2,300 starting W but 1,200 W to run, and a hammer drill takes 3,000 W to start but only 1,000 W to operate. Conversely, your halogen work light takes 1,000 W to run. If you add up the items above, it will total 5,200 W (3,000 + 1,200 + 1,000), so you’ll need a generator with a continuous power rating of at least a 5.2 kW (5,200 W). If you can’t find the wattage amount, don’t worry. All you need to know is the volts and amps of your equipment. To calculate the wattage, just multiply volts times amps. So, your circular saw, which operates on 110 V and consumes 20 amps, needs 2,200 W to run and requires a generator with a power rating of at least 2.2 kW (2,200 W). Just remember: Only equipment with electrical motors require additional power at the beginning to start. Not understanding power requirements can have consequences. Take wet stacking, for instance, which is a condition where gross dark liquid congeals in the generator’s exhaust stacks. This occurs when unused diesel fuel, accumulated moisture and carbon particles are allowed to gather in the exhaust of a gen set. This can happen for a number of reasons — a gen set sitting unused or not having fuel in your unit — but also running the generator at less than 60 percent of its rated output. Did you know you can actually connect multiple generators together to increase the power capacity, control load management and ease maintenance for a group of generators? It’s called paralleling. By paralleling multiple gen sets together and matching the load to the power need, it can even offer better fuel efficiency. “It is something that’s being used all over the world, and we’re trying to implement it here in the U.S.,” says Angel Nieto, product manager of power and light at Atlas Copco. The paralleling process involves the physical connection of two or more generators and the synchronization of their outputs, matching the waveform of the output voltage of one unit with the voltage waveform of the other generator or generators. Factors include capacity, redundancy and compliance with electrical standards. While the buzz about alternative fuel has died down with the decrease in diesel fuel prices, there is an expectation that chatter will begin again when diesel prices rise. Bi- or tri-fuel add-on systems for generators are enabling diesel units to use natural gas or some other variant, saving fuel costs compared to burning diesel fuel alone. By incorporating battery packs or supercapacitors in the gen set package, excess power can be captured and stored. This allows the generator engine to be turned off and run off the stored power in the batteries or capacitor, saving on fuel consumption. Battery storage is not the only technology mobile generator manufacturers are embracing. Telematics is becoming more and more commonplace, making significant headway in the portable power industry. With the ability to monitor the generator remotely, telematics offers users the opportunity to operate their generator from afar. With remote message and data assessment, contractors are able to understand how their gen set is functioning at any given moment without physically being in front of the machine. Beyond these integrated technologies, there is a move to make these machines as easy to operate as possible for the end-user. Using computerized controls and simple start/stop buttons, users can understand how to operate these mobile generators at first glance. 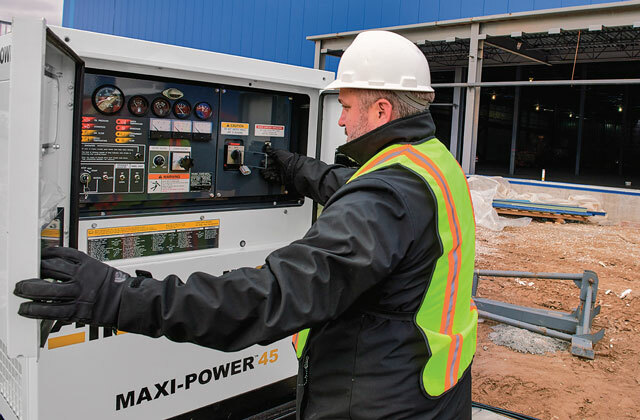 Advanced power panels are being built into compact, enclosed generators where operators can access key operations and information. For companies using generators in remote locations, whether they are running sprinklers on a farm or empowering operations in remote oil and gas projects, perhaps no development is more exciting than the growth of remote controls. Operators and their service companies can receive maintenance reminders to schedule service, monitor and act upon warnings, overloads and other alerts and even resolve engine problems via telematics — mentioned above — but also start and stop a unit remotely. All of these developments are significant, and they only hint at the future of power equipment advancements. We predict that the market for portable generators will continue to accelerate, especially with the increasing demand for backup generators to protect against weather outages and grid overloads. Dawn Geske is a freelancer writer for Compact Equipment. The technology of the future is heating up for the power generation industry with an eye on energy storage. As mobile gen set manufacturers look for ways to make their units more efficient in light of Tier 4 Final, battery storage is becoming a viable option that many are considering. 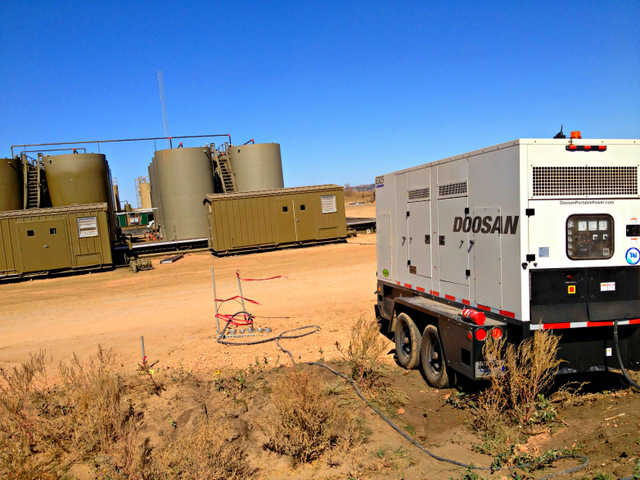 “Generators don’t run anywhere near their rated capacity or rated output, so there’s a lot of extra energy there to be harnessed,” says Todd Howe, product manager at Doosan Portable Power. By using battery packs or supercapacitors to capture the excess energy that the engine creates in these mobile generators, there is an ability to store power for later use. This power allows the engine to shut off and use its stored power to electrify the load at the same capacity. “If we took that power and stored it in batteries or supercapacitors, that would allow us to shut the engine off and run off stored energy for a period of time and then restart the engine when the batteries drain down,” says Howe. Using energy storage provides a lower cost of operation as the engine only needs to run when power levels increase, and there is not enough saved in the battery pack or supercapacitor. Fuel consumption also decreases, and there is less stress on the engine over time, increasing runtime and resale value. “That could be a major impact on fuel consumption because you’re going to run the engine at its most efficient operating point,” says Howe. While energy storage has not gone mainstream as of yet, it is on the minds of many mobile gen set manufacturers that feel it could help displace the growing cost of diesel fuel. We have even more info on generators here.